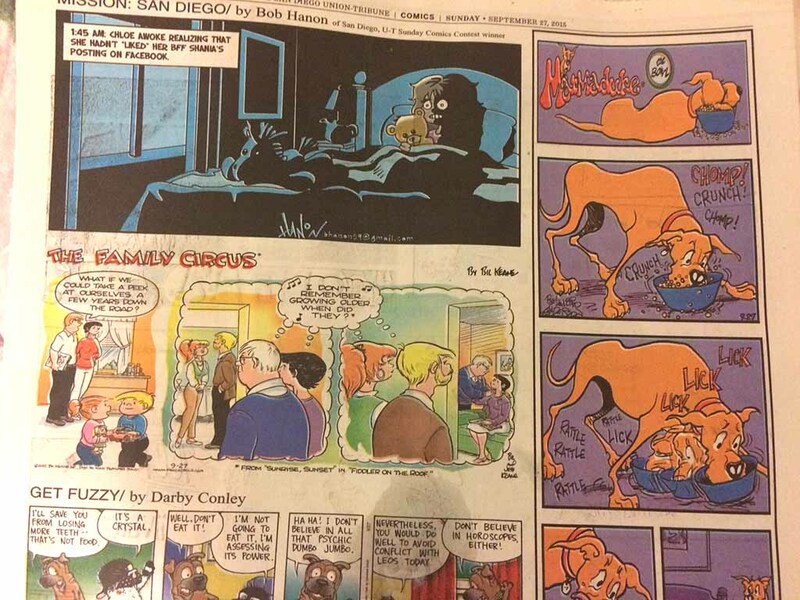 Doonesbury fans in San Diego were dismayed to open Sunday’s San Diego Union-Tribune and find the strip missing — replaced in the comics section by Marmaduke. Section of Sunday North zone comics emailed to several readers by U-T Editor Jeff Light. What taboo topic did cartoonist Garry Trudeau tread upon this time? What controversial content might have led to it being yanked? U-T Editor Jeff Light said it was a contractor’s mistake and promised that the Sunday strip — about Donald Trump’s “huge” presence in the presidential race — would appear in the B-section of Wednesday’s city edition. Responding to a handful of reader complaints, Light explained that the Florida service that lays out the comics section accidentally left out Doonesbury for the Metro zone version of the comics — four full-color pages. The strip made it into the North zone comics, which has six pages of comics — including some strips formerly in the North County Times. Why didn’t Doonesbury simply go in its traditional spot — vertically stacked on the far-right side of the fourth page? 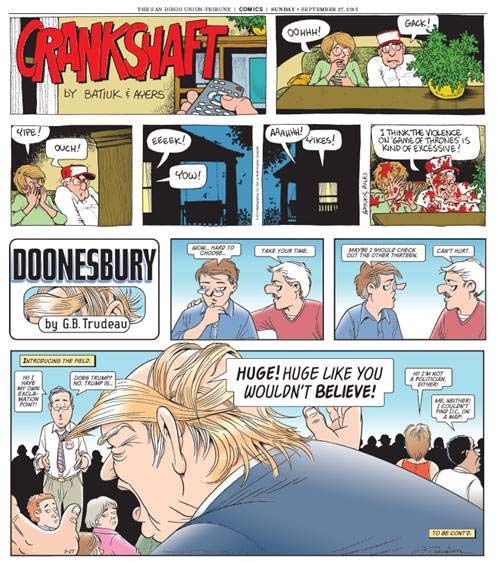 In Sunday’s case, however, Doonesbury was drawn in an unusual shape — four panels instead of seven, including an oversized one featuring Trump dwarfing his GOP rivals. Chicago-based Tribune Publishing owns the U-T and sister Los Angeles Times, having bought the San Diego daily from Doug Manchester in May. The U-T has been printed in Los Angeles since mid-June. Universal Press Syndicate, which distributes the nearly 45-year-old strip, didn’t respond immediately to a request for comment. Readers couldn’t be blamed for suspecting a problem with Trudeau’s subject matter. Washington Post comics columnist Michael Cavna, a UC San Diego graduate who was a deputy arts editor at the U-T and a syndicated sports cartoonist, has written about Doonesbury being pulled by papers. Most were withdrawn for controversial material. In October 2008: Obama Wins? Yes, ‘Doonesbury’ Calls the Election! 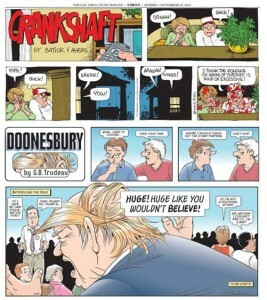 In September 2011: Papers pull ‘Doonesbury’ — but must satire really be ‘fair’? Fun fact: Doonesbury character Uncle Duke, based on Hunter Thompson, was briefly captain of Donald Trump’s cruise ship, the Trump Princess.